June 2, 2014 by Melanie L.
I do not remember the first day of Kindergarten. First Day of Kindergarten. I’m the runt in red with my hand shielding my eyes. The others from left: Steve, Ali, Cindie, and Emily. In fact, there is not much I do remember about that entire year. My memories of Kindergarten are limited to that mad crush I had on Mighty Mouse, my brand-new character-licensed sneakers to prove it, and that one moment on the classroom stoop, just a few steps from the playground when I sat next to Russell (not pictured) and discovered that he, too, loved Mighty Mouse and had his own brand-new sneakers to match. What I lack in foggy memory, though, I have in bright pixels. 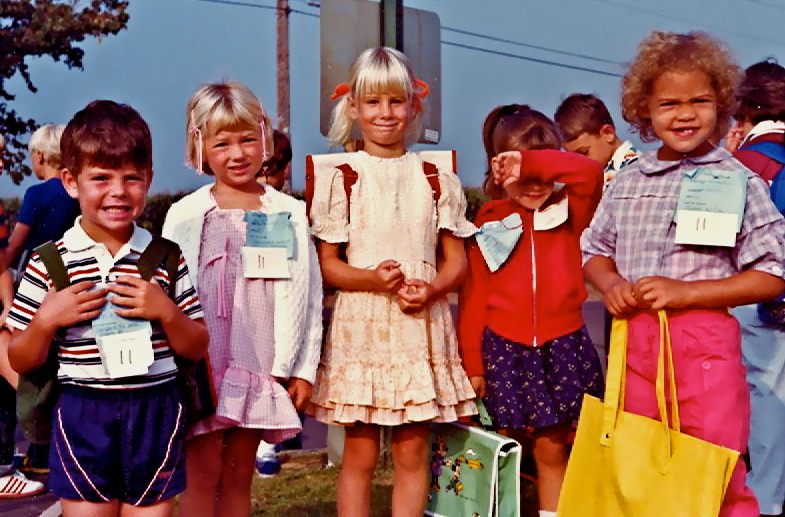 Now that my eldest, is about to start Kindergarten in the fall, I have been spending a lot more time reminiscing by wading through as many photos as I can find – like this photo taken at the bus stop (by Steve’s mom, Peggy) on the very first day of school. When I examined this photo closer, however, I noticed that this photo said less about us as we were on that innocent day, but instead screamed about us as we would come to be in the future. Steve, on the far left, dutifully obeys what must have been his mother’s (repeated?) request to smile, and he is the only one truly trying. He sure was sweet but also a bit of a rascal. Perhaps in that smile one can see a little Lothario. This dutiful son is the face of my very first kiss which took place the following year. The two of us, six years old, slipped into the back of his mother’s wood-sided station wagon and touched lips with equal parts revulsion and curiosity, the way I imagine the fabled Princess first kissed her frog. Next to him, Ali, oh sweet ebullient Ali, sheds her effervescence for this particular picture and instead stands where the sun incited a small uprising on her visage between her triumphant squint and her defeated smile. A prelude, perhaps, to the epic battle for her life she would go on to face a mere 28 years later. Cindie, tallest and in the middle, is and always was sweet and a bit spunky, but yet she is pictured here with balled fists and smug smile. It’s as if she just rescued a friend from a bully with a swift punch. And, she did do just that, but not for another 8 years, when a mean girl in the middle school locker room decided to steal the jeans I was attempting to put on – with my leg still in it! This is how Cindie looked on that day in eighth grade, and save for this one picture, that day only. And, then, here pictured on the far right is Emily, sporting pink pants and a mane of beautiful curly locks, well, any locks at all for that matter. But, her expression is not just a squint against the blazing sun, it is a face full of protest at having to take a picture in the first place. And protest, she did for many years. About a decade after this picture was taken, she railed something fierce against the gender norms imposed upon her. She played soccer better than the boys. Later, she would go on to shave her head, wear dark neutrals, and, if I remember correctly, she protested the restrictions on her date’s gender at prom. (Em, do I have that right? Or was it the fall dance?) In any event, even though this photo predates her struggles, she already wears her battle scars. Finally, there’s me, with my face obscured by my own arm. Despite the fact that at that time, I was exceedingly outgoing and talkative, sassy even, my pose here foretells a loss of confidence near the end of primary school that would go on to shape all of my relationships, up to and including my marriage. But, before any of those things would come to pass, on this day, we were just a bunch of five-year-old neighbors who were staring into the blinding sun while waiting for the yellow school bus to pick us up for our very first ride. I’ll have to search beyond this first picture I found of me in the first album I looked, to find the innocence of the present moment untainted by the impending future. SO glad to have found your blog… wait, you found me. Thanks for finding me! Just found you through Maggie’s comments. Enjoyed your post, thank you! Thank you for visiting! I’ll have to thank Maggie for the new traffic. I hope you’ll come back and visit again ! Yes Melanie, I have ticked follow, so hopefully your posts will come through! Mighty Mouse? I’m the lone stand out, because I didn’t like him and never believed he’d save the day. Oops. Wait. I didn’t go to kindergarten either. Our town was too small to have one 🙂 Is that why? Love the photo and the writing style, though 🙂 Visiting from Maggie’s, which I got to from Greg’s. It’s a long story. 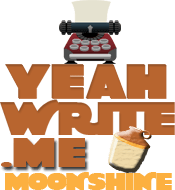 Well I’m so glad you stopped by to visit my blog! I hope you’ll come back again! Love the sentiments you generate with your writing. I can’t help but feel sad when I look at these kind of pictures and remember a time before loss of innocence. Of course, it’s all just ” life” and is not in itself a bad thing. It probably wasn’t actually “all that” back in the day as a child, but it’s great to reminisce about the simple life. Thanks so much for sharing, perfect weekend breakfast read! I love kindergarten photos, so much going on in them. You look and wonder what the kids were thinking and who they would grow up to become. It’s true. The truth of our personalities are present even at 5-years-old. Feels like we’re completely different from back then, but we really don’t change all that much, do we? Maybe it’s a bit of both? We change and grow but there’s a part of each of us that remains the same. A part that is engrained in out nature and not influenced by our surroundings? Definitely! But nature/nurture are not mutually exclusive concepts. Nature is inherited after centuries of environmental selection. I rarely look at old school photos. I was always the shy misfit and looking at school pictures brings back the trauma. Still, I wonder if I could make the same connections if I did look back. I’m sure you would see something in them you hadn’t before. But dredging up past hurts doesn’t sound fun.